"Very powerful. It is good to have a clear syndrome named and legitimized. The case histories were lucidly written and whilst the sample is small and a clear minority of adoptees, the analysis of why some adoptions go so badly wrong is terrific. Once again, many thanks David." 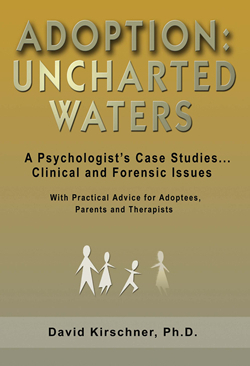 Anthony Douglas, Chief Executive of CAFCASS, England and Chair of BAAF, UK (British Association for Adoption & Fostering) writes of Adoption: Uncharted Waters, 12/30/2006. "A must read. I found the book interesting, intriguing and well-supported by well-known members of the adoption community." Adoption Today Magazine, August/September, 2006. "Kirschner brings attention to the concept of Adopted Child Syndrome, which is bred through lies and fantasies about birth parents." Fostering Families Today Magazine, July/August, 2006. "The author has treated hundreds of adoptees, provided forensic testimony in high-profile cases, and is credited with identifying ACS." Child Welfare Report, July, 2006, Vol. 14, No. 7, Resources. "A courageous, ground breaking book. David Kirschner, a dedicated clinician, has gone into unchartered waters and dares to tell us about a small subgroup of adoptees who have committed serial murder and parricide. Though other therapists have turned away, Kirschner has sought to understand them, and even defend them in court. We are not stigmatizing adoption when we open ourselves to this subject. As Kirschner - who has treated hundreds of adoptees - says in this work, only by understanding the why of these cases can we effectively treat and prevent such tragedies in the future." "Although ADOPTION: UNCHARTED WATERS is a study of David Kirschner's work with a select group of adoptees , it is germane to a much larger population. I found the case histories fascinating, largely because Kirschner demonstrates rare understanding and empathy as well as an ability to write about his patients in a clear and interesting manner. Hopefully, the book can help in earlier identification and treatment, and it should be read, not only by those in the adoption triad, but by anyone interested in the criminal justice system." "In writing ADOPTION: UNCHARTED WATERS, David Kirschner has forged a courageous path into a little-known phenomenon, that of the overrepresentation of adoptees as parricides and serial killers. As an expert witness, Kirschner has examined and defended many of these individuals, for whom anger and impulse control are problematic. Understanding why some adoptees kill, is important to the prevention of future crimes of this nature, as well as insights about those whose behavior hasn't yet reached this degree of violence. Little attempt has been made to understand the trauma of separation from the birth mother and the difficulties of growing up without genetic mirroring that all adoptees face." "ADOPTION: UNCHARTED WATERS... a thoughtful provocative, and well written book about adoptees who kill. David Kirschner accurately presents the psychological world of adopted people. His book is a must read for anyone who wants to understand what sows the seeds of violence in some of them." "Perhaps the stories contained in this authorative and sensitive book, will finally get the Adopted Child Syndrome the attention it deserves. David Kirschner's fascinating case histories send a warning that we ignore at our peril - for here, certainly, experience is a teacher no one wishes to meet. For decades, Kirschner has attempted to sensitize us to needs of this most vulnerable population. As an advocate for children with disabilities for 30 years, I stand and applaud his work - BRAVO David." "ADOPTION: UNCHARTED WATERS... offer new insights into the inner world inhabited by adoptees whose anger could not be contained. Kirschner's new book is important for all those who work in the criminal justice system - where young adopted offenders - are vastly overrepresented. But it also a primer for adoptive parents on what not to do, and a serious wakeup call for well-meaning but misinformed therapists and mental health professionals, who have ignored the warning signs for too long."